I spend a lot of time speaking about, writing about and advising my clients about content marketing. As a writer, I know original content is the most powerful way to gain influence and establish your authority. I’ve always felt that providing consultation and practical advice is the best way to attract prospects and keep my clients happy. Lately, I’ve been feeling like something is missing in that equation. Guess what? It’s got nothing to do with content. If you’ve ever sold a house, you’ll know the importance of what Americans call “curb appeal”. 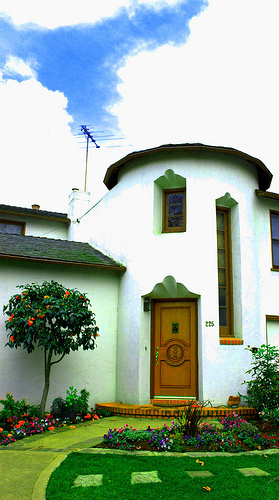 Essentially, a house that makes a good impression from the road has curb appeal. Real estate agents counsel sellers to invest in a bit of landscaping, slap a fresh coat of paint on the fence and make sure the windows sparkle. Why? A large percentage of home buyers decide whether or not to look inside a house or take it seriously based on what they see when they drive by. What does that have to do with content marketing? I’m discovering business content needs curb appeal. The most fabulous subject matter will go unnoticed without a good reason for someone to open it up. Headlines do their part in getting people to start reading. Reams of space and paper have been dedicated to educating writers on the art of writing the perfect headline. But what possesses someone to pick up a brochure and actually read it? What never fails to encourage someone to linger at a website? Design. Good design attracts people. From my own experience, I know quality content often languishes. Unless you give it curb appeal, you must be prepared to have your content ignored. It’s why blog posts contain more and more images in them. Humans are visual creatures and plain type on white paper doesn’t inspire anyone. Take the same information, format it with good colours, attractive images and an easy-to-read layout, and the document no one was interested in suddenly starts to get a lot of traffic. Content without design is often nothing more than stagnant content. Design is what gets noticed and is the first important step to having your information digested by the people you want to see it. While I’ve been focused on delivering valuable content, I’ve come to realise quality writing and good research aren’t enough. Even with mature social media and SEO campaigns, a document with a dull appearance isn’t going to be successful. If it’s not successful, it’s not an asset to your company. I now consider design an essential element to the success of a content marketing strategy. I consider it equally important to the content itself. It’s why you’ll hear me talk more and more about something I call “Asset Based Marketing”. I’m most interested in developing products for my clients that become assets to their businesses’ websites, white papers, case studies, blogs, and newsletters among others. Nothing I write classifies as an asset unless it has curb appeal. A critical part of my epiphany is the importance of collaboration with professional designers in the content strategy. Yes, I can cobble something together using wizards supplied by whatever software I’m employing. It’s not the same thing. Original content deserves custom design. Both a talent and a discipline, design requires distinct skills and training. To produce real assets, design needs to be given equal consideration in the long-term strategy and budget of a marketing effort. Good content will prevail but it can take a long time. To maximise the success of your content marketing strategy, you need to invest in professional design and make it a collaborative exercise. By giving design and content equal consideration, you begin to create assets for your company that are able to build influence and pull prospects and customers into your sphere. Your content isn’t truly an asset without it. Remember: “Asset Based Marketing”, you heard it here first. What is your opinion about the value of design in your marketing strategy?